In 2008 one of the worlds leading online chess shops opened it’s doors for the first time. Since then the little embryonic business has become one of Europe’s leading suppliers of luxury chess sets and traditional wooden games. Based in the UK the business has been expertly shipping it’s range of chess and backgammon sets all over the world since then. 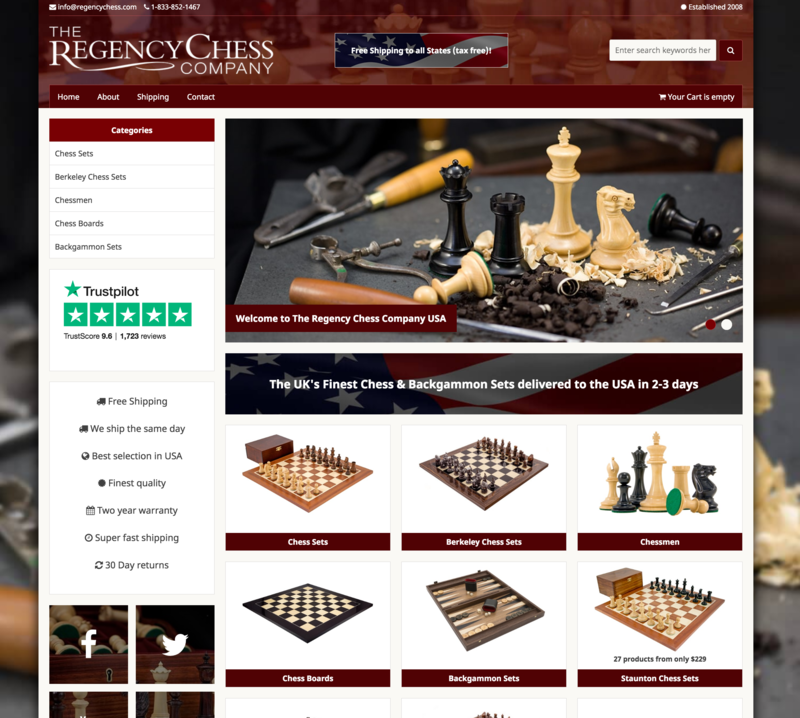 If we fast forward a whole decade to 2018 the Regency Chess Company has now opened up it’s doors in the United States with a website dedicated to US customers only. The site features a superb and growing range of lovely chess sets and exclusive backgammon products. The US order are sent within one working day directly from the UK warehouse using UPS, which means delivery will take place in around two working days. There is also the added benefit of tax free shopping (all orders under $850 usd) due to a new import tax law that came in recently. What makes The Regency Chess Company so special? 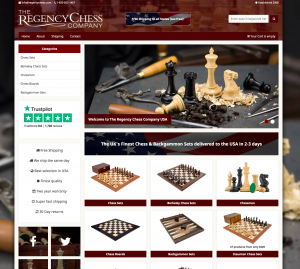 From the very early days the owner and founder of The Regency Chess Company has been obsessed with product quality, how those products are presented online, and customer service. The business has an amazing score on the online review site Trust Pilot and it goes out of the way to ensure that it’s customers are well looked after. Many of the products are sourced exclusively for Regency Chess and each set has been carefully put together to ensure the perfect match between board and pieces. One of the main specialisms of the company is it’s range of luxury wooden chessmen, especially Staunton ones. Back in 2008 Julian Deverell, the owner and founder of the business had a chance meeting with Rishi Sharma, a member of the family who’s business had been supplying the worlds finest chessmen to The House of Staunton. Julian and Rishi agreed business terms and the fine chessmen soon became the bedrock of the product range on the Regency Chess Website. Since then the range has grown with luxury products being imported from India, Spain, Germany, Italy, Greece, Poland, The Netherlands and England, with the budget plastic products coming from China. Why should I buy from Regency Chess USA? Why not a local US company? The Regency Chess Company can offer the highest quality, a carefully selected range of products and very competitive tax free pricing. There will be no import tax to pay and all order are shipped using UPS express. You can be assured that you’re dealing with one of the worlds most caring chess retailers. Going forward it will be interesting to see how the UK based Regency Chess Company can compete in the US chess market. There it little doubt that the product range and quality combined with their excellent customer service will make them a very viable contender. Let’s see where we are in another ten years!